Soursop is spiky green fruit that’s grown in South America, Africa, and Southeast Asia, and makes a very unique body scrub filled with skin nutrition. Sour-wha? Here’s the lowdown: Kinda pineappley, kinda strawberry-y (and all sorts of delicious), the leaves are where the real magic happens. These big, smooth fronds are full of vitamins A and B, and vitamin C, which soothes the skin when it’s acting all funky - we’re talking serious relief for eczema, rheumatism, and other skin conditions. 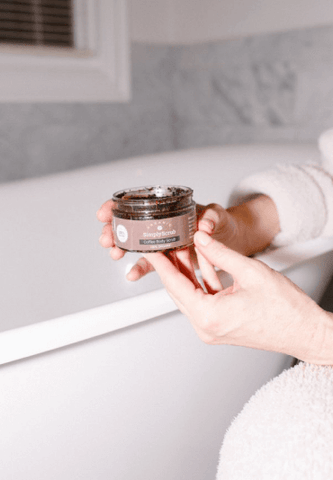 Combine that with the anti-inflammatory effects of mint, a little gentle exfoliation from the brown sugar, and a whole lot of vitamin-rich oils, and you’ve got the perfect potion to help keep even your worst skin situations at bay.